The Capitol Center is a class “A” property located across the street from the South Carolina State Capitol in downtown Columbia. It’s anodized aluminum entrance and noisy sliding doors were dated and didn’t match the buildings upscale facilities and feel. 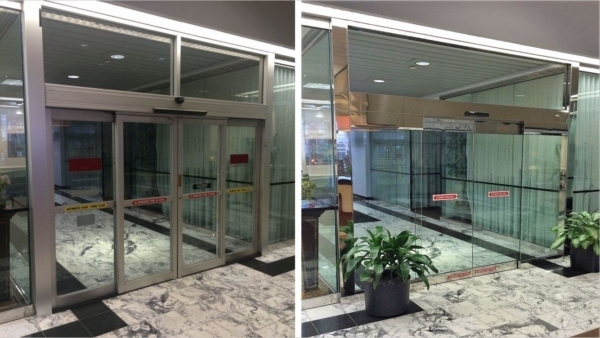 The building’s owner reached out to Piedmont Door Solutions for a much needed update and was pleased with the final results. With clean lines, an elegant polished steel clad and a more minimalistic frame design the new slider package redefined the entrance to the property. Instead of meeting a set of dated and bulky doors visitors now encounter this modern all glass package which gives the entrance an open feeling. In addition to aesthetic benefits the new doors will cut maintenance cost, be much more energy efficient and add security to the building. The doors were installed by the experienced and talented team from Piedmont Door Solutions’ Columbia location. This attention to detail is nothing out of the ordinary for a management team that is personally invested in the professional and quality completion of every project.